Shriram Automall Helping Truckers Grow their Business/Fleet! If you’re the owner of a small trucking business, you know it’s tough to compete with larger fleets. The obvious advantage of more trucks often means that they can offer more aggressive pricing, hire drivers more quickly and generally leverage their size to deliver faster. So what can you do today to grow your trucking company to compete with the big guys? The first thing you need to do to grow your company is to get the right kind of equipment. 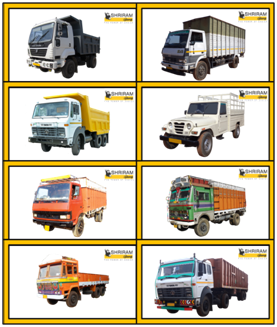 Shriram Automall through its inventory available in every nook and corner of the country offers best in class used trucks of every make and model at optimal prices. Most truckers run into a hurdle when they try to get used vehicle & equipment because they require financing. Securing financing can be difficult. But with SAMIL you can acquire your desired used truck without any second thoughts as company being the 100% subsidiary of India’s leading NBFC – Shriram Transport Finance Company provides finance facility at easy EMIs. As the entire country knows SAMIL consider its customer’s perception their Reality. Thereby company provides innovative services that are targeted to solve all types of used vehicles and equipment requirements in the country. You as well to grow your business or fleet, let your customers know that you care about them and while committing this to them, offer them your best services. Finding shippers and loads is the toughest part of running a trucking company. SAMIL as a company witness many owner-operators who look for loads using a load board on daily basis. This approach has some advantages, since the load board allows you to choose loads that match your equipment and your preferred routes. We hope this blog as well as our inventory to help you out for any and every transport business you are looking forward to expand. Be it Owner/Operator trucking, Taxi Hiring, Moving van business, Food Trucking Business, Livestock transportation, Medical transport etc. we offer used vehicles and equipment of all types and models. So, visit your nearby Automall to acquire the one you need or download our MySAMIL Mobile App to learn more about us while going through our inventory at the comfort of your home.